Living with food intolerances presents many challenges. I love the flavour punch that pickles, chutney and spicy sauces deliver to a meal of smoky barbequed meat, but there’s a problem. All my favourite old recipes have a huge amount of onion, garlic or apple on their ingredient list which strikes them from my diet. Rather than be deterred, it’s set me on a quest to reinvent those delicious preserves to make them acceptable without any flavour compromise. Surprisingly, the Asian sauces are proving to be the simplest despite their notoriously heavy use of shallots and garlic. Substitutions can be drawn from a long list of other aromatics. Root ginger, galangal, kaffir lime leaf and zest, lemongrass, garlic chives and coriander root are just the beginning. I used a few different recipes, including my own to cross reference when I made this spicy sauce. I was determined to create a rich punchy flavour without onion, garlic or coconut milk, I wanted to prove that deprivation and dietary limitations do NOT go hand in hand. My next post will tell you how I used my low FODMAP satay sauce to dress a vegetable salad. Put the chilli flakes into a small bowl, por the vinegar over and allow to soak for 15 minutes. Warm the oil in a small pan and cook the ginger over a low heat until transluscent. Add the peanuts, peanut butter, sauces, chillis in vinegar and sugar. Stir until the peanut butter melts and the mixture is well combined. Slowly stir in the coconut water, bring to the boil then reduce the heat to a low simmer and cook until thick. Store in a covered container tin the fridge. This looks delicious. Can Coconut milk also be used? I have a young friend who has been advised to follow the FODMAP diet, given her intolerances which cause her a great deal of distress. She was feeling depressed about missing out on the foods that she loves. I have recommended your blog to her and she is already excited. Things don’t have to lack flavour. Thankyou for providing such an excellent resource. Yes coconut milk is fine. It gets a green light on the diet but I can’t tolerate it. Rachel got in touch yesterday. I suggested she ask you for some sourdough starter to convert. I’m slowly inching my way toward a FODMAP recipe book. Great idea. I have the starter for her and hope she can follow your technique using spelt. Yes, a Fodmap book is what is needed. In the meantime, I advised Rach that your posts are as good as a book. You and a few other cooks that I follow are to be commended, Sandra. It’s not just that you’ve learned to live with these dietary restrictions but you really have thrived, developing tasty dishes that, in many ways, are superior to those they are meant to replace. 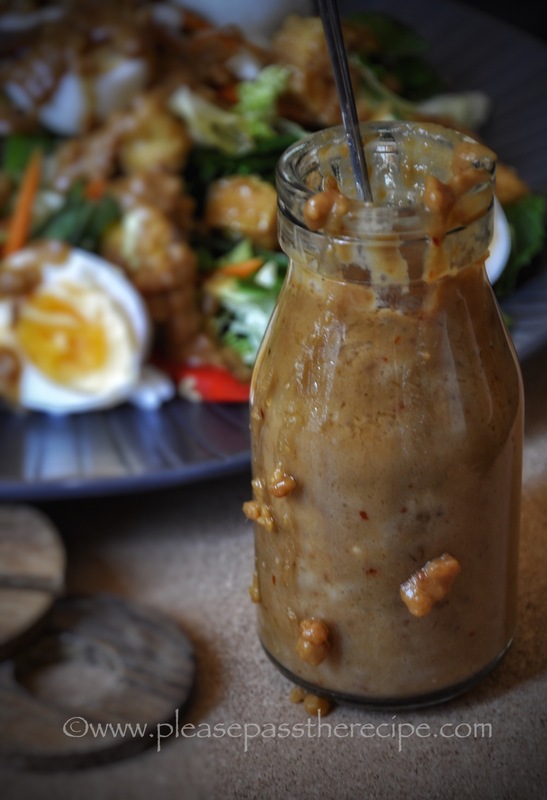 I bet this peanut sauce of yours is vastly better than any peanut sauce that I’ve been served at any restaurant. No doubt about it. Looks incredible. We use so many sauces and I keep saying it’s time to make more of them ourselves. I will have to try this out. Nice to know you’ve found a way to enjoy sauces with dietary restrictions. I don’t give up easily, I like flavour too much. You might need to modify the chilli a little for the boys, but you are the best judge of that..
Is it hot? Or merely..mmm…full tasting? Im going to try making it. This sounds right up my alley. But what is kecap manis? Well, the only food to which I seem to be allergic is the Asian fruit ‘durian’ – the ‘stinky’ one which nearly sent me to hospital in Singapore 😦 !! Don’t think I’ll shed tears over that!! That said, I make and eat a lot of peanut and other sate etc sauces and yours has really caught my fancy . . . real curiosity as to taste especially as I have never used coconut water in mine . . thanks!! Great photo Sandra and the sauce looks delicious. This looks delicious! FODMAPS are out for me too and it can make cooking challenging at times! I will definitely try this out! Oh it is KandK, and with plenty of robust flavour and no irritating FODMAPS. This entry was posted on January 12, 2016 by ladyredspecs in Dairy Free, FODMAP diet, Food, Gluten Free, Lactose Free, Preserves, Sauces and tagged chilli, gluten free, lactose free, low fodmap, peanut, satay, sauce, vegan, vegetarian.